Malaysia’s election result back in May of this year was, in spite of the country’s recent political troubles, something of a shock. The Barisan Nasional (BN) coalition of parties that had ruled the country since its independence in 1957 was ousted, and then-92-year-old former prime minister Mahathir Mohamad was back in charge. Mahathir had previously served as leader of the BN himself, but joined the opposition, Pakatan Harapan, in 2016 following allegations of corruption levelled at his former party. Even though BN’s popularity had been on the wane, incumbent prime minister Najib Razak was still expected to win another term. His defeat is not just a political surprise – it also represents the chance for an economic overhaul. One of Mahathir’s earliest actions has been to cast doubt over billions of dollars’ worth of China-backed infrastructure projects. The proposals, which include rail connections with Kuala Lumpur and gas pipelines in Borneo, have been criticised as overpriced and weighted in Beijing’s favour. The new prime minister’s actions may appear impulsive, but they just might be in Malaysia’s best long-term interests. To understand Mahathir’s decision, one needs to understand the political mess that has been allowed to fester under his predecessor. During Najib’s stint in power, he established the 1Malaysia Development Berhad (1MDB) state investment fund that has since found itself at the centre of corruption allegations. Najib himself was recently charged with three counts of money laundering in connection with a former 1MDB subsidiary, though he has denied any wrongdoing. It is difficult to say by exactly how much the various projects have been overvalued – Chin suggests that the high-speed rail link with Singapore may have been “overpriced by about 100 percent” – but they are certainly costly. In total, projects worth up to $23bn could ultimately be suspended, including the East Coast Rail Link (ECRL), one of the most expensive railways in the world. The 88km-long ECRL is set to cost CNY 66bn ($9.6bn), averaging out at just under $110m per kilometre. This compares unfavourably with other recently proposed long-distance rail projects: Bangladesh’s Padma Rail Link, which is also being constructed by Chinese contractors, is set to cost around $10m per kilometre. 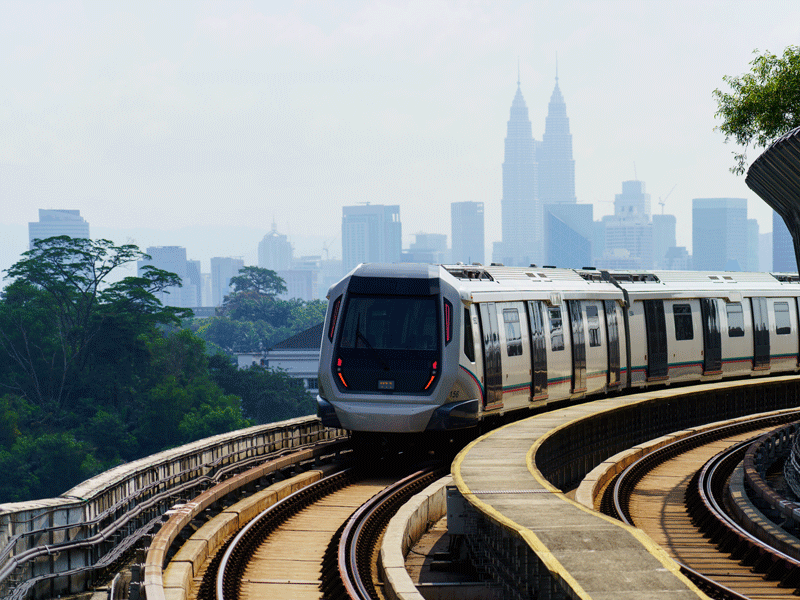 Although the price paid for rail projects in different parts of the world can vary for a multitude of reasons, the prices quoted in Malaysia do seem exorbitant. Perhaps more worrying is the one-sided nature of the deals struck between China and the previous Malaysian Government. In an unusual move, the payment plans for the oil and gas pipelines to be built across Borneo were agreed on a temporal basis rather than being determined by the construction’s progress. This has meant that while only 13 percent of the pipelines have been completed, approximately 90 percent of the estimated cost has already been paid to the China Petroleum Pipeline Bureau. There are also increasing murmurings that the questionable infrastructure projects could be connected with the 1MDB scandal that first rocked the country in 2015: Malaysia’s finance minister, Lim Guan Eng, said in a press conference in early June that he was “strongly suspicious” that some of the negotiated pipeline projects were part of the scam. As well as the projects’ inflated price tags and snail-like progress, many of the contracts contain a number of red flags that indicate due diligence was not carried out. Several connections between the government bodies set up to oversee the projects and the now-disgraced 1MDB fund only serve to add to the murkiness. Infrastructure projects are usually a sign of a country’s economic wellbeing. They signify that travel is about to get more efficient, previously disconnected regions are to become integrated into the national economy, and a country is worth investing in. They should not be pursued, however, simply for the sake of it. In Malaysia’s case, it seems that the China proposals may not really have been necessary. Growth in Malaysia is already meeting expectations, putting the country at risk of overheating if the infrastructure projects do go ahead. The economy expanded by 5.4 percent in the first three months of 2018, and although this figure represents a second successive quarter of deceleration, the country still boasts a favourable trajectory. 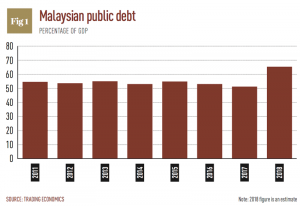 In addition, shedding the infrastructure proposals could help Malaysia reduce its growing debt burden. Lim recently revealed that public debt could be as high as 65 percent of GDP (see Fig 1), making it one of the biggest in the region. Cancelling unnecessary construction would free up some much-needed government funds. Even if Prime Minister Mahathir only withdraws from a few of the costliest projects, this would still help to balance the books. The ECRL and the high-speed rail line to Singapore alone are projected to cost roughly $16bn, equivalent to eight percent of Malaysian GDP. While the sudden decision to cancel a host of infrastructure projects would normally be a sign that something is drastically wrong with a country’s economy, for Malaysia, this is not the case. When construction works are of dubious economic value, they only really benefit the people signing the contracts and pocketing funds. In Chin’s view, although the decision to reset these initiatives could hurt investment and growth in the short term, “in the long term, it will be positive”. Although it is conceivable that other countries could follow Malaysia’s lead and push back against China’s infrastructural ambitions, this appears unlikely. With its good credit rating, large capital reserves and growing domestic economy, Malaysia was relatively well placed to reject China’s proposals. Not many other developing nations are in a similar position. Chin noted: “Many in Malaysia were worried about China being the biggest creditor for the infrastructure projects and whether that would grant [it] undue influence”. Their concerns were not without merit: late last year, Sri Lanka had little choice but to hand over its Hambantota Port to China after failing to meet its debt repayments. Furthermore, there is a suspicion that the development projects that form part of China’s Belt and Road Initiative are not entirely altruistic. Pressing pause on China-backed proposals may risk souring relations with Beijing, but other regional powers may also be dismayed. Although Malaysia’s Singapore rail project is likely to go ahead, the fact that Mahathir initially vowed to cancel it will not have done much good for relations between the two countries. Breaking international agreements is sure to create tension. Although the fate of many proposals remains undecided, Chin believes that China will reduce the value of the projects as it is “playing a long-term game”. This would be preferable to seeing them aborted completely, allowing Mahathir to keep some of the proposals in place without losing face among his supporters. During Mahathir’s previous spell in charge of the country between 1981 and 2003, his economic policies were known for bringing great benefits to the Malay community, but often to the detriment of the country’s Indian and Chinese minorities. If he does receive more economic freedom as a result of renegotiating Malaysia’s infrastructure projects, he will need to use it to ensure that everyone benefits. That is the only way that his country will be able to thrive in South-East Asia, one of the world’s most competitive regions.